Hearthstone with Friends has been a slightly complicated process since launch – more often than not involving an external meet-up via Skype, followed by an exchanging of numerical game IDs from a main menu determined not to minimise under any circumstances. 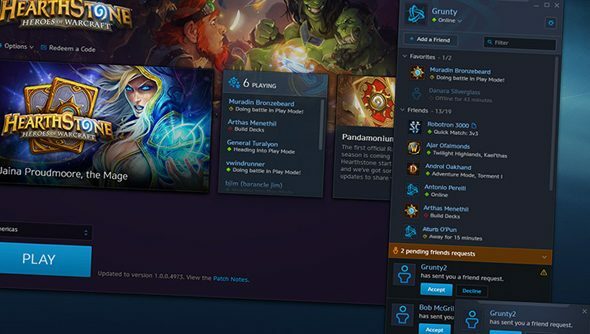 That’s to change – and in WoW, and Diablo, and StarCraft – with the introduction of direct chat to the battle.net desktop app. Look for the Friends icon in the top-right corner of battle.net on next login. Through that, you’ll be able to access a contacts list, replete with statuses (Online, Busy or Away) and individual chat boxes. Desktop messages will show up in whichever Blizzard game you might be playing at the time – making a round of Hearthstone a valid way to fill the gap before raid time, for instance. You can customise which activities trigger pop-up notifications according to your taste and patience, and unwanted friend requests can be reported and/or blocked with a press of an ‘!’ icon. Regular compadres can be tracked in a select sub-list of favourited users. Chat doesn’t quite work both ways: if a character friend within WoW or Diablo III messages you in-game, no notification will appear on the desktop app. But for now, this is a useful way to further unify a set of games which otherwise share plenty of crossover, in lore and audience. Let’s not get carried away though, eh Blizz: Hearthstone should never, ever get text chatfor games with strangers. Do you think you’ll make use of battle.net chat?